In this painting, Whispered Words Gauguin seems to have gone back five years to the tapestry¬like landscapes of Martinique with their rich and textured surface. Colors and contours are softened, light toned down by an atmosphere that appears to penetrate figures and ground and trees, giving the whole an almost Venetian aspect that rounds the forms while preserving the pattern. 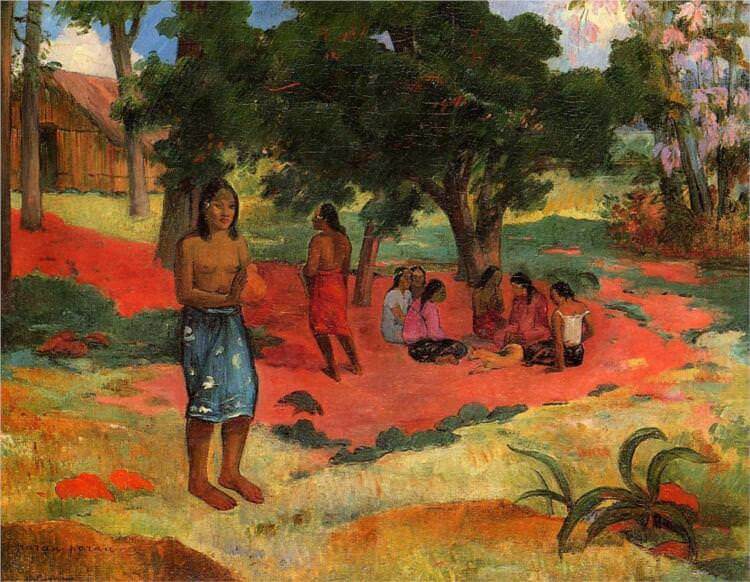 Here, in abundance, is that matiere of which Gauguin was so aware, and which we associate too little with his art. "Wanting to suggest a wild and luxuriant nature, and a tropical sun which makes everything around it blaze, I had to give my figures an appropriate setting. It is really life in the open - an intimate life all the same, among the thickets and the shaded brooks; these women whispering in an immense palace which Nature herself has decorated with all the riches that Tahiti holds. Hence these fabulous colors, this fiery, yet soft and muted air. "But all this does not exist! "Yes, it exists as the equivalent of this grandeur and profundity, of this mystery of Tahiti, when it has to be expressed on a canvas three feet square. "The Tahitian Eve is very subtle, very knowing in her naivete. The enigma hidden in the depths of her childish eyes remains incommunicable to me. She is Eve after the Fall, still able to walk naked without shame, possessing all her animal beauty of the first day. Like Eve, her body has remained animal, but her head has evolved, her mind has learned subtlety, love has impressed an ironic smile upon her lips, and naively she searches her memory for the why of present times. Enigmatically she looks at you. "All this is intangible, they say. "So be it, I am willing to agree."